I am shocked, that I am not more shocked, but such are the times we live in. A sitting U.S. Senator does not bat an eye that Hillary, Barack and other members of the House and Senate have gone along with a "program" that funded terrorists, and the blood of thousands are on their hands. In the brand new 1st video below, Luke Rudkowski from WeAreChange confronts US Senator from New York and Hillary Clinton supporter Kirsten Gillibrand about the Middle East quagmire and Hillary's support of ISIS and other terrorists in the Middle East. Rather than deny the fact that Hillary and the US have been supporting mass murderers ISIS and other terrorists, Gillibrand writes off this fact as 'an accident'. With ISIS allegedly having released another new video showing the slaughter of over 200 Syrian children, there is clearly blood all over the hands of Hillary yet she's clearly getting a free pass from the large majority of American citizens and the media. Would only a picture of Hillary herself holding the machine gun and opening fire upon these brutally slaughtered children awaken the stupefyingly dumbed down American masses who see this mass-murderer approving psychopath as some kind of a saint? 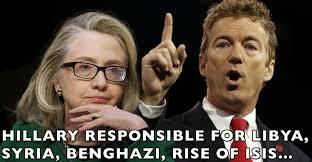 With RINF having released a story today proving that the uprising against Syrian president Assad was engineered in the United States and the Syrian war largely the trigger for the humanitarian crisis that is being used to overthrow Europe, was US Senator and current Republican presidential candidate Rand Paul correct when he said Hillary is responsible for the disasters in Libya, Syria, Benghazi AND the rise of ISIS? In this video, Rudkowski gets in a few very good questions, in between the other media who fawn over the Senator and fawn over Clinton. With new evidence coming out showing a US Apache attack helicopter flying support for ISIS terrorists crossing from Iraq into Syria as shown in the 2nd video below, we see this as another sign that America is about to go down a very dark path with terrorist supporter and sympathizer Clinton possibly only a year away from the US presidency. Is Clinton ONLY running for the US presidency to stay out of jail as was recently suggested by Donald Trump? How could America allow this supporter of terrorism into the White House? You can reach the office of US Senator Kirsten Gillibrand at (202) 224-4451 to voice your own opinions about this video. More below. Why would a US Apache attack helicopter be flying support for ISIS terrorists as seen in the next video below? There seems to be a lot going on behind the scenes that the American people do not know about. 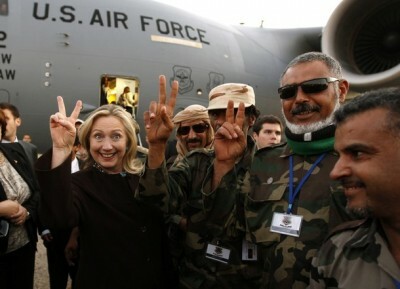 Why are Hillary Clinton and the US Military supporting child-slaughtering terrorists ISIS? Why isn't the mainstream media reporting upon any of this? If the American people allow such evil to take control of our country, we deserve what they bring us. If America allows Hillary Clinton to assume control of this country after Barack Obama is gone, we would simply deserve all of the evil that she would brings along with her and as most alternative news readers know, we're rapidly heading down a very dark and potentially dangerous and deadly path.